Danielle Trofe molds mushroom roots called mycelium into a velvety, sophisticated shade. Danielle Trofe crafts this modern lamp with mushrooms. No, really. The Brooklyn designer puts mushroom roots called mycelium in a mold and… mushBOOM: a velvety, sophisticated shade is born. 100% biodegradable, it's a truly sustainable (and, we confess, slightly geeky) answer to high-end lighting. To finish the piece, build the base—made from salvaged ash wood—without any tools, and go from grow to glow. Handmade in New York. Can't get enough of mycelium magic? 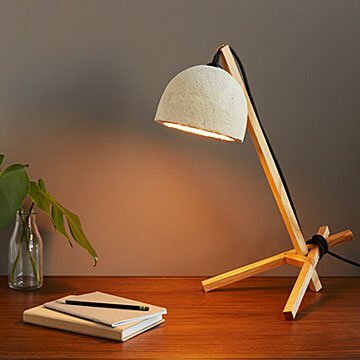 Read all about the Mushroom Lamp on our blog. Danielle Trofe is a Brooklyn-based designer who takes a function-forward, sustainable, and socially responsible approach to furniture and lighting design. By harnessing innovative technologies and material sciences to create functional and accessible design, she aims to encourage a departure from conventional materials and production techniques in search of long-term, sustainable solutions. To remove dust, use a damp paper towel and blot. This lamp lights up the office of a research scientist who studies mycology. It looks great and shows off the versatility of mycelium!